Protect your garden furniture from the rain, frost, snow, UV rays, dirt, dust, grime. With this high quality cover. Thick 240g/m² 600D polyester Oxford fabric. T PVC coating and Grade 4 UV stability. MANAGERS SPECIAL - PARASOL COVER FEATURES SUPERIOR QUALITY MULTI-LAYERED LAMINATED POLYETHYLENE 100% WATER RESISTANT UV PROTECTION COLOUR: GREEN 190cm x 96cm. GARDEN CUSHION STORAGE BAG FEATURES SUPERIOR QUALITY 100% WATER RESISTANT PVC COATED BAG BODY 2 CARRY HANDLES UV PROTECTION QUICK DRY VENTED COLOUR: BLUE 150cm x 75cm x 70cm. PARASOL COVER FEATURES SUPERIOR QUALITY 100% WATER RESISTANT PVC COATING UV PROTECTION QUICK DRY VENTED COLOUR: BLUE 190cm x 48cm. CANTILEVER PARASOL COVER FEATURES SUPERIOR QUALITY 100% WATER RESISTANT PVC COATING UV PROTECTION QUICK DRY COLOUR: BLACK 216cm x 152cm. BISTRO SET COVER FEATURES SUPERIOR QUALITY 100% WATER RESISTANT PVC COATING UV PROTECTION QUICK DRY VENTED COLOUR: BLUE 180cm x 70cm x 90cm (Back) / 70cm (Front) Also suitable for: Benches, Companion Sets. 4 SEAT DINING SET COVER FEATURES SUPERIOR QUALITY 100% WATER RESISTANT PVC COATING UV PROTECTION QUICK DRY VENTED COLOUR: BLUE 200cm x 90cm. 6 SEAT DINING SET COVER FEATURES SUPERIOR QUALITY 100% WATER RESISTANT PVC COATING UV PROTECTION QUICK DRY VENTED COLOUR: BLUE 250cm x 170cm x 90cm. 8 SEAT DINING SET COVER FEATURES SUPERIOR QUALITY 100% WATER RESISTANT PVC COATING UV PROTECTION QUICK DRY VENTED COLOUR: BLUE 300cm x 170cm x 90cm. 6 SEAT ROUND SET COVER FEATURES SUPERIOR QUALITY 100% WATER RESISTANT PVC COATING UV PROTECTION QUICK DRY VENTED COLOUR: BLUE 265cm x 90cm. 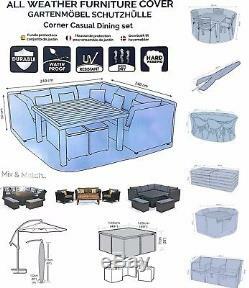 MEDIUM CORNER CASUAL SET COVER FEATURES SUPERIOR QUALITY 100% WATER RESISTANT PVC COATING UV PROTECTION QUICK DRY VENTED COLOUR: BLUE 190cm x 190cm x 90cm Also suitable for: Sofa Sets. LARGE CORNER CASUAL SET COVER FEATURES SUPERIOR QUALITY 100% WATER RESISTANT PVC COATING UV PROTECTION QUICK DRY VENTED COLOUR: BLUE 240cm x 240cm x 90cm Also suitable for: Sofa Sets. EXTRA LARGE CORNER CASUAL SET COVER FEATURES SUPERIOR QUALITY 100% WATER RESISTANT PVC COATING UV PROTECTION QUICK DRY COLOUR: BLACK 300cm x 270cm x 71cm Also suitable for: Sofa Sets. MEDIUM CUBE SET COVER FEATURES SUPERIOR QUALITY 100% WATER RESISTANT PVC COATING UV PROTECTION QUICK DRY COLOUR: BLACK 125cm x 125cm x 71cm Also suitable for: Sofa Sets. LARGE CUBE SET COVER FEATURES SUPERIOR QUALITY 100% WATER RESISTANT PVC COATING UV PROTECTION QUICK DRY COLOUR: BLACK 135cm x 135cm x 71cm Also suitable for: Sofa Sets. 6 SEAT CUBE SET COVER FEATURES SUPERIOR QUALITY 100% WATER RESISTANT PVC COATING UV PROTECTION QUICK DRY COLOUR: BLACK 213cm x 132cm x 71cm Also suitable for: Sofa Sets. SMALL 2 SEAT SOFA COVER FEATURES SUPERIOR QUALITY 100% WATER RESISTANT PVC COATING UV PROTECTION QUICK DRY COLOUR: BLACK 160cm x 87cm x 69cm. LARGE 2 SEAT SOFA COVER FEATURES SUPERIOR QUALITY 100% WATER RESISTANT PVC COATING UV PROTECTION QUICK DRY COLOUR: BLACK 160cm x 94cm x 69cm. SMALL 2-3 SEAT SOFA COVER FEATURES SUPERIOR QUALITY 100% WATER RESISTANT PVC COATING UV PROTECTION QUICK DRY COLOUR: BLACK 173cm x 87cm x 69cm. LARGE 2-3 SEAT SOFA COVER FEATURES SUPERIOR QUALITY 100% WATER RESISTANT PVC COATING UV PROTECTION QUICK DRY COLOUR: BLACK 173cm x 94cm x 69cm. SMALL 3 SEAT SOFA COVER FEATURES SUPERIOR QUALITY 100% WATER RESISTANT PVC COATING UV PROTECTION QUICK DRY COLOUR: BLACK 246cm x 87cm x 69cm. LARGE 2-3 SEAT SOFA COVER FEATURES SUPERIOR QUALITY 100% WATER RESISTANT PVC COATING UV PROTECTION QUICK DRY COLOUR: BLACK 246cm x 94cm x 69cm. LARGE CORNER UNIT COVER FEATURES SUPERIOR QUALITY 100% WATER RESISTANT PVC COATING UV PROTECTION QUICK DRY COLOUR: BLACK 93cm x 93cm x 68cm. CORNER UNIT COVER FEATURES SUPERIOR QUALITY 100% WATER RESISTANT PVC COATING UV PROTECTION QUICK DRY COLOUR: BLACK 87cm x 87cm x 68cm. LARGE CENTER UNIT COVER FEATURES SUPERIOR QUALITY 100% WATER RESISTANT PVC COATING UV PROTECTION QUICK DRY COLOUR: BLACK 83cm x 93cm x 68cm. CENTER UNIT COVER FEATURES SUPERIOR QUALITY 100% WATER RESISTANT PVC COATING UV PROTECTION QUICK DRY COLOUR: BLACK 73cm x 87cm x 68cm. The item "OUTDOOR GARDEN PATIO FURNITURE COVER SUPERIOR QUALITY COVERS WATERPROOF" is in sale since Friday, November 17, 2017. This item is in the category "Garden & Patio\Garden & Patio Furniture\Outdoor Furniture Covers". The seller is "completegardens" and is located in Whitstable. This item can be shipped to United Kingdom, Austria, Belgium, Bulgaria, Croatia, Cyprus, Czech republic, Denmark, Estonia, Finland, France, Germany, Greece, Hungary, Ireland, Italy, Latvia, Lithuania, Luxembourg, Malta, Netherlands, Poland, Portugal, Romania, Slovakia, Slovenia, Spain, Sweden, Australia, United States, Canada, Japan, China, Israel, Hong Kong, Norway, Indonesia, Malaysia, Mexico, Singapore, South Korea, Switzerland, Taiwan, Thailand, Saudi arabia, South africa, United arab emirates, Ukraine.